Daawat-e-Ishq (“Feast of Love“) wants to be a strong social statement against dowries. In reality, it’s a fantasy film for men’s rights supporters. The movie opens with a card explaining that, though the practice of dowry payments has been illegal since 1961, one woman is killed every hour in India because her family cannot afford to pay the fee demanded by her prospective husband’s family. Despite being an ace student, star athlete, and total knockout, no man will marry Gullu (Parineeti Chopra) because of the measly dowry her widowed father (played by Anupam Kher) can afford on his law clerk’s salary. After having her heart broken by a rich guy named Amjad, whose family demands an outrageous sum to approve the marriage, Gullu decides to use the law to her advantage. She and her father leave Hyderabad for Lucknow, where they assume false identities in order to land Gullu a rich husband. After the wedding, the plan is for Gullu to file a suit against the groom’s family accusing them of dowry extortion (section 498a in the Indian penal code). Presumably, the family will settle out of court, and Gullu and her dad will have enough money to move to America so that she can become a shoe designer. Gullu and her dad pick Taru Haidar (Aditya Roy Kapur) — a restaurateur from a rich family — as their mark. Unfortunately for Gullu, Taru is nice, virtuous guy who doesn’t like that his parents have asked for a dowry. Gullu must decide whether to confess her scheme or take Taru’s money and break his heart. Thus does a movie about the evils of a system which unfairly punishes women turn into a tale with a wealthy man as the system’s true victim. 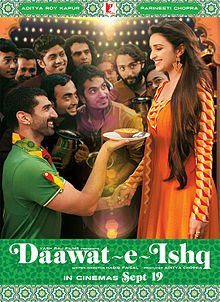 For a movie as mind numbingly slow as Daawat-e-Ishq, the twist that positions Taru as the victim still comes as a shock. His character doesn’t even show up until forty minutes into the film, and he’s introduced as a loud, tacky boor. His victimization is supposed to sting not because of who he is or the audience’s affection for him but for what he represents: an innocent man exploited by a law designed to protect women. There are so many reasons why the movie doesn’t work, and all can be laid at the feet of writer-director Habib Faisal. Faisal asks his talented cast to overact. The film looks dingy and flat. For a movie about a chef with “Feast” in the title, precious little time is devoted to Taru’s culinary creations. The camera pans quickly past the dishes with nary a description or lingering shot. The screenplay is the film’s biggest problem. As mentioned above, Taru isn’t introduced until forty minutes have elapsed, time that is instead spent on Gullu’s futile romance with Amjad and a couple of lifeless songs. The romance between the leading couple is compressed into a single song, which isn’t enough time for Chopra and Kapur to develop any kind of chemistry. Faisal lets down his heroine in the way he transforms her from an unappreciated modern woman into a ruthless criminal mastermind. The circumstances that prompt her to concoct her extortion scheme aren’t dire enough to warrant it, and the whole plan seems out of character for a woman who takes pride in succeeding on her own merits. Gullu’s heel-turn opens the door for a song in which the “black magic woman” wreaks havoc “while the mustache studs looked on in dismay.” Taru’s lawyer friend shouts, “All the girls of India will learn a lesson that they shouldn’t trick innocent boys into 498a.” I’m sure the twenty-four women murdered today over dowry would feel properly chastened, were they still alive to do so. This entry was posted in Reviews and tagged 1 Star, Aditya Roy Kapur, Anupam Kher, Bollywood, Daawat-e-Ishq, Feast of Love, Habib Faisal, Hindi, Indian, Movie Review, Parineeti Chopra on September 19, 2014 by Kathy. Sorry that the film let you down. and your review, hammers it home. I was ready to head up to Tampa today to see this one and Khoobsurat – but the rain was too heavy for me to take on that long of a drive. Khoobsurat and Daawat-e-Ishq are both playing at the same theater in Tampa along with Finding Fanny and none of them are here in Sarasota. But I will see Daawat on way or another as Parineeti has been on my radar for a while. As for Khoobsurat, same applies to Sonam Kapoor. You always get it right when Bollywood filmmakers get it all wrong while giving a social message. I read the synopsis yesterday and I straightaway decided to stay away from this one. The only reason is that I just couldn’t accept the character of Gulrez becoming, in blunt terms, a criminal! Thanks, Keyur! The filmmakers would’ve had less trouble had they not tried so hard to send a social message (and a conflicting one at that!). Yes, it just kills such an important message. That just about sums it up, Nav.